Academic Competitions: We always talk about a great sport competition that we saw or how well Marching Band did in a competition. There are, however, certain times during the year when there are some academic competitions that are just as inspirational and competitive. Mr. Duda took the Academic Decathlon team to Westhill High School this past weekend so that they could compete against other top teams in the county. If you have never attended an "Aca-Deca" competition, there are many teams. Each team receives a question and has a period of time to answer it. Points are awarded...you get the picture. These are not easy questions, and Google is not an option. At the end of the competition, the team with the highest number of points advances. West Genesee placed second to a very worthy opponent, Cazenovia. I am very proud of them. 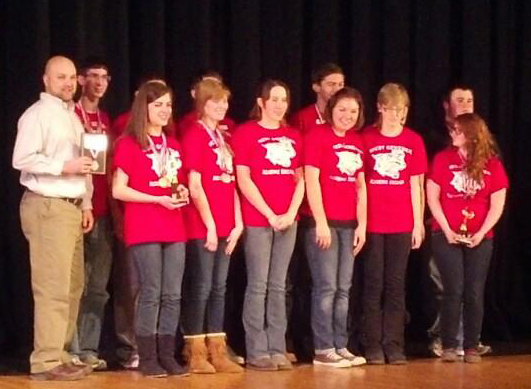 Our team will now be headed to the state competition on March 15-16 at Onondaga Community College. We are hopeful they will advance from there to the national competition on April 25-27 in Minneapolis, MN. Congratulations! Music is in the Air: We are closing in on our high school musical, Jekyll and Hyde. This is a contemporary production that the students are really excited about. The stage design is unbelievable. It includes tall English style wooden towers that feel like they reach right out into the audience. The performances are February 7-9, and I am looking forward to watching it from my balcony seat on that Friday night. If you have some time and want to see a quality, contemporary production, you will not be disappointed. Seats for all three shows are reserved and are $10 each. You can purchase presale tickets online by going to www.westgenesee.org then go to the Fine Arts section for the link or to our ticketing site at www.etix.com. You can also call the Ticket Call Center at 1-800-514-3849, extension 4. Tickets can be purchased at the door. Sports Sectionals: It is about another ten days before sports teams head into sectional competition, and I feel that some of our teams have deceptively low records. I am looking forward to them surprising some people later next month. I have included a picture of our girls hockey team (we are a part of the Skaneateles hockey team along with Auburn and Baldwinsville). They begin their sectional competition this Wednesday in Skaneateles. Good luck girls! Developing Staff is Important: Today, Monday, is a staff development day. What are we developing? We are picking apart the common core standards, fine tuning our performance review system and goals, conducting a table top exercise related to school safety, updating our building and District level safety plans to reflect recent developments, and flipping the switch to make all of the features in Schooltool available to others. A pretty packed day! Have a wonderful week basking in the "warmth" that is temporarily coming our way. As frequent readers of this blog, I do not want to punish you with the gripping details about State Aid formulas, categories, and itemizations. I value my readers and want you to keep reading. Therefore, I am going to give you the quick overview of what the Governor's budget proposal means for West Genesee. The Governor included a State Aid increase totaling a 2.9% increase over last year. He also included a one-time increase in aid for full-day kindergarten which we are starting this fall. The two aids put together total a 9% increase which is what was reported by local media. The 2.9% increase in state aid is 2.9% more than we thought we would get entering the budget development process. This will be helpful for us because our state pension and health insurance costs alone represent a 3.34% increase all by themselves. The additional aid will allow us to maintain existing programs while keeping the tax levy well under the tax cap for West Genesee. Have I kept this easy enough to understand so far? My comment about the budget proposal overall is that I think it is fair considering we have had very large budget gaps to close the past couple of years and the area unemployment is at 8.5%. You will not hear me say anything negative about the Governor's aid proposal. In a perfect world, he would work to allow the State Aid formulas to flow the way that they used to, but I have come to the realization that this is not a perfect world. Maybe someday. We have been working with a financial plan that we created three years ago and it is right on track. This would not be possible without the support of our staff and community and I am very appreciative. Celebrating Diversity: Dr. Martin Luther King shared many messages during his abbreviated lifetime. Most influential for me was his belief that we should celebrate diversity and that everyone should be treated equally, regardless of color, gender, or belief. We have worked very hard as leaders and community members to help this message come true each day. Because we are a suburb, people think that we have no diversity in our school or in our community. This could not be farther from the truth. We have many different nationalities, colors, orientations, and socioeconomic groups represented in our District. My feeling about all of this is, "big deal". I really don't care where you come from, what color your skin is, how much money you make, or what your orientation is. We all shop at the same stores, attend the same events, share many of the same values, and all want our children to do well. It is unfortunate that each day I read about other communities where people have not gotten over themselves, and they are still fighting for power over beliefs related to wanting inequality to succeed. Here we celebrate diversity. Each year we teach about the work that Dr. King did, and I am happy when I am in a classroom and hear "why did he have to fight for that?" That means that our students have reached the stage of acceptance, and in their lifetime they have not known anything different. Acceptance translates to power. Students will work with anyone to advance and find success for the greater good. I think that would make Dr. King very proud, and I am very appreciative of his efforts. New School Record for Wrestling: Congratulations to senior Connor Grome. He now holds the West Genesee record for all time wins in wrestling at 132. That is quite an accomplishment. Congratulations! Mid-Term Week at the High School: Please remember that this is mid-term week at the high school. You can check paperwork that has come home for your child's schedule, or you can check our website for general information. Weather: Also please keep an eye on the weather. While we are not expecting any significant snowfall, temperatures will be very cold. Make sure that your children are bundled up at the bus stop, and make sure that your student drivers leave a few minutes early. Have a great week and hope to see you at some of our events. I hope that you had the opportunity to enjoy some of the amazing weather over the weekend. It seems as if over the past few years we have gotten a little break from the cold and snow. I used the time to get an outside run in, stack more firewood in the garage, take down all of the outdoor Christmas decorations, and even play a little driveway basketball. If the forecast rings true next week, I will be blogging about how cold it is again! Sports Teach Character: Last week I had an opportunity to meet with our hockey team in their locker room at Shove Park. You might say, "who cares?". Our hockey program is very young this year, and as a consequence they have lost more games than they are used to. However, the losses have come from lack of experience; not a lack of heart or drive. The learning opportunity that existed was too good to pass up. In the big picture, very few students get an opportunity to experience success and failure through sports and fine arts. Unfortunately, those opportunities come for most of them when they are adults, and their supports are not around which makes the learning curve much steeper. As the hockey program has been historically successful, a few losses brings out the doubters, the boo birds, and the pessimists. We spoke about what it means to dig through that and find inner strength, a strength that makes you block outside voices and allows one to elevate themselves to the next level. We agreed as a group that I am proud of them, and they are proud of themselves. They are going to work together to overcome their inexperience and finish the year strong. They are 2-0 since that meeting and even if they are not able to find success in the win/loss column the rest of the season, the life lesson that sports is supposed to teach will shine through for these few athletes lucky enough to be a part of a great program. This is reason number one billion why athletics, fine arts, and extracurricular activities are important for students. Academic Update: On the academic front, we made some great strides with our K-12 mathematics program. We have had someone taking a look at our curriculum maps, sequencing, and overall programming as we implement the new common core learning standards. We are also looking at a way to help our elementary and middle school teachers get a better understanding on the best ways to teach some of the new material. I am math certified 7-12, and there have been three times this year when I walked through a classroom and had not seen the topic being taught before. For many of our K-8 teachers this means that some of the topics have not been seen by them since they were high school students themselves. I am thoroughly convinced that this one two punch of math help for our staff will propel us over the top. The next step will be to focus on some new curriculum for math in grades 3-8 and then there will be no looking back. I have not been as excited about an educational initiative since we added support a few years ago for our struggling learners. Stay tuned! Two Year vs. Four Year Colleges: One last thing that I have my eye on is the battle between two year and four year colleges for the tuition dollars of our children (http://www.huffingtonpost.com/2013/01/09/two-year-degrees-vs-four-year-degrees_n_2439934.html). It used to be, hands down, that the four year degree helped someone to earn more than someone with a two year degree. In many fields that tide has changed, and the two year degree actually helps someone to earn as much as someone attaining a four year degree. Why does this matter? I think that this might help ease some of the "fiscal cliff" resistant tuition increases that exist, and it also gives a two year college like our very own Onondaga Community College an awesome opportunity to excite students who might not have been considering college. Keep an eye on this in the coming months. To say my plate is full this week is an understatement. I will be at many different events and meetings, and it is my hope that we have a chance to cross paths. Have a wonderful week! By now you have heard or seen what the Governor had to say about New York State Public Schools for next year. If not, he would like to see greater accountability, a longer school day and/or year, a better connection to college and career readiness, performance pay, and a continuation of the evaluation systems for teachers and administrators. What appears to be resonating with students and staff the most is the possibility of a longer school day, year, or both. The Governor indicated that the State would pay for any additional hours spent as long as a plan exists to show how a longer day and year will lead to an increase in student achievement. I have indicated in the past that I am a quality, not quantity person. However, I think that some, although not all students, could benefit from some additional teacher contact time. I am also well aware that some students, parents, and staff would and would not support a longer school day or year. My simple advice is this: until the Governor comes out with how he is going to fund schools in general for next year, not including the new initiatives, I am not spending one more brain cell thinking about it and neither should you. When, and if, the time comes (and I have faith in the Governor that it WILL happen SOMEDAY) we will get the hamster wheel going again and come up with something that works like we always do. On a different note, we are still evaluating school safety and what changes or additions we might need to make. Right now we are looking at entry systems, additional cameras, and how we can use our School Resource Officer position differently. I am also attending two forums next week with Federal and State law enforcement officials to get the most up-to-date information. As the parent of a high school senior, I felt that our holiday break went much too quickly. January means only five months until graduation. In most years I hope for time to fly leading up to graduation, but this year I hope that these last five months drag a little! There is a lot going on around the District: Training, testing, budgeting, scheduling, sports, concerts, and a musical are just a few of the things that our staff and students are occupied with. I know that the students would love to see you at their events, so if you have some free time please check our website and schedules. 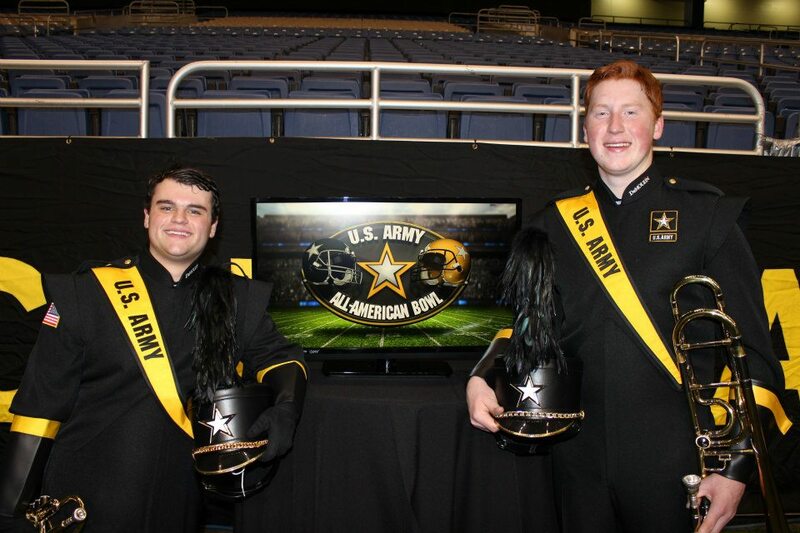 Pictured at right, high school seniors Nicholas Piato and Shawn Davern get ready for their dress rehearsal for the US Army Marching Band that they performed in at the All-American Bowl on January 5. Report from Commission on Education: Last week the Governor announced the results from his Commission on Education. There were eight key points from the Commission and the Governor acknowledged that not all of them would be able to be completed in short order. Instead of going through each of the eight recommendations in this blog, you can read the entire report by clicking here, and I will wait until the Governor's State of the State address this week to speak about any specific recommendations that might be featured in his speech. Communications - Print vs Digital: We are nearing the date when we will no longer receive a local daily paper. I certainly understand the decision, and I thought that because I do most of my work in a digital environment (this blog, Twitter, Facebook, and our website) that I would not have any feelings about the change as the date gets closer. I was wrong. I really like receiving the newspaper. Personally, I feel that printed articles help keep Government and organizations, that we as citizens support (including schools), honest. I also feel strongly that what is in print creates a longer lasting memory than anything digital. My mom still shows me pictures and box scores from my own high school days that she cut out and saved from the paper. As with many things in life, we need to adapt and overcome. The change to our local paper is no different. We have an outstanding public relations person in Bonnie Russell, and before I could even think about what changes we need to make as an organization to keep getting our information into your hands, she sent me a list of things that will be changed to adjust to the lack of a local paper. Please check our website later this month for a story about how we will be communicating to television and print media moving forward. We are fortunate that we are already thriving in the digital, social media environment. This week, for example, we will pass 2,000 followers on my Twitter feed, this blog will be read by over 5,000 people by the end of the week, and with our Facebook friends the weekly total reach has increased by over 120%. If you enjoy receiving your information through these sources, please let others know so we can continue to build our information network. The last thing we want is for someone to not be aware of what is happening in their school district. A heat wave is upon us (for my national followers and friends, that means temperatures of about 30 degrees). Not quite shorts weather, but warm enough to soak in a little sun while out for a walk. Have a great week!